Alex Lopez ’19 has been filming in Rwanda over the past two summers, telling the story of a young man with HIV. Denison’s Center for Narrative Journalism hosts a select gathering of professional journalists and students. Allison Koneczny’s research won the award for the best undergraduate empirical research at the Ohio Psychologists Association conference. Summer research by Sihan Cai ’20 is moving technology one step closer to an error-free future. Sam Fujikawa ’22 and Meg Odell ’19 gain experience and technique as they perform for competitions and in productions. Denison and Kendal launch a new Artist-in-Residence program that promises to benefit both campuses. Actor, advocate, and businessperson Jennifer Garner ’94 will serve as the keynote speaker at the college’s 178th Commencement Ceremony. 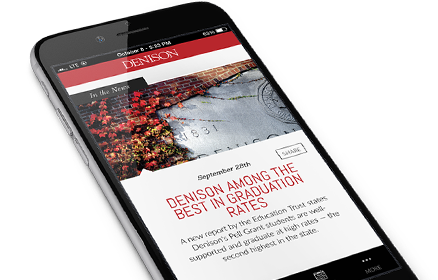 Get Denison University's mobile app for on-the-go news, stories, and upcoming events from the college and its athletics teams! Denison men’s and women’s swim & dive teams were hugely successful at NCAA nat’ls. Men won their 5th championship & women placed 3rd in the nation. Attorney Aaron Webb ’96 is COO of Morning Pointe healthcare services company. Webb majored in black studies and political science at Denison. You can develop an effective mindfulness practice with Mindful Denison Coordinator Linnea Pyne. Tima Kaba ’19 practices mindfulness and shares the benefits with her friends and community. Students study how stars are formed through data and find surprising support for a new model. Phantom of the Opera, 30 years old, is a re-imagined spectacle, starring Herb Porter ’13 as iconic Raoul at the story’s center. Biochemistry major Dr. Jason Bell ’97 is an ophthalmologist with Cincinnati Eye Institute, and several times noted as a “Top Doctor” in Cincinnati. Observation without criticism is one way to describe Mindfulness. Denison President Adam Weinberg shares his view. “Underground Fugue” by author and professor Margot Singer has been shortlisted for a Jewish Book Council award. Ro Nita Hawes-Saunders ’73, CEO of the Dayton Contemporary Dance Company, will receive an honorary doctorate from the University of Dayton. Poet & professor David Baker’s latest volume, “Swift: New and Selected Poems,” is devoted to observing change over time. Alper Tuzcu ’11 premiers CD at Boston Turkish Film & Music Fest. Alper Tuzcu ’11 premiers his new work, “Aurora,’ at the Boston Turkish Film & Music Festival. Find a place where your student can find great mentorship, opportunities to engage deeply, & fellow students with whom they will build friendships. For a leg up in the competitive job market, students head to a three-day Career Boot Camp.